On the Facecömic number 44 I invited 250 participants to #SomeTime2011, which will be held at Aalto Design Factory, Espoo, Finland on 10-11.6.2011. They all came and now we have full house! Now I'm inviting you to my Facecömic Work Shop, which will be held at "Engine Room" on Saturday 11.6.2011 at 11 a.m. and it lasts one hour. 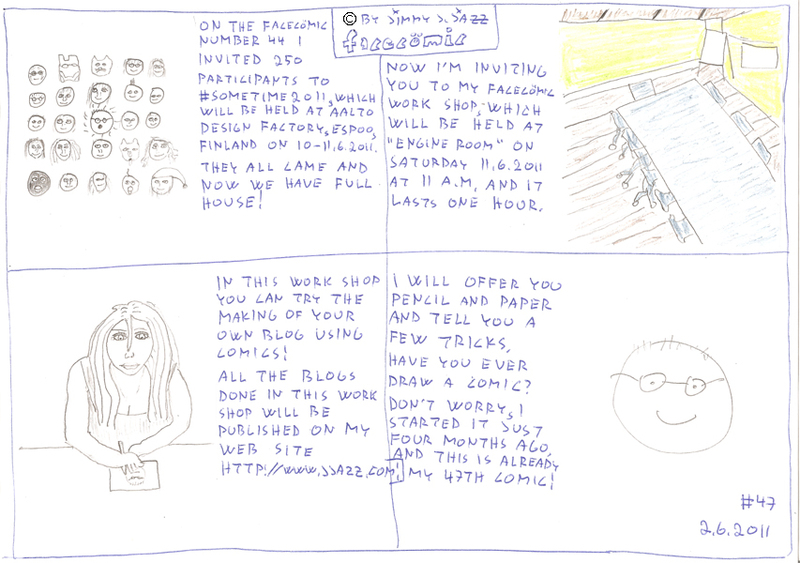 In this workshop you can try the making of your own blog using comics! All the blogs done in this work shop will be published on my web site http://www.jjazz.com! I will offer you pencil and paper and tell you a few tricks. Have you ever draw a comic? Don't worry, I started it just four months aho and this is already my 47th comic!